Whether choosing your first power wheelchair or your next power wheelchair, picking the correct drive system for your needs is one of the first and most important decisions you’ll make. The location of the drive wheels (the wheels powered by the motor) in the rear, middle or front of the chair has a definite effect on the chair’s performance in different environments. Up until the 1990s, most power chair users had only one choice: rear-wheel drive. But nowadays, users can pick among a number of different systems, each with its own advantages and disadvantages. 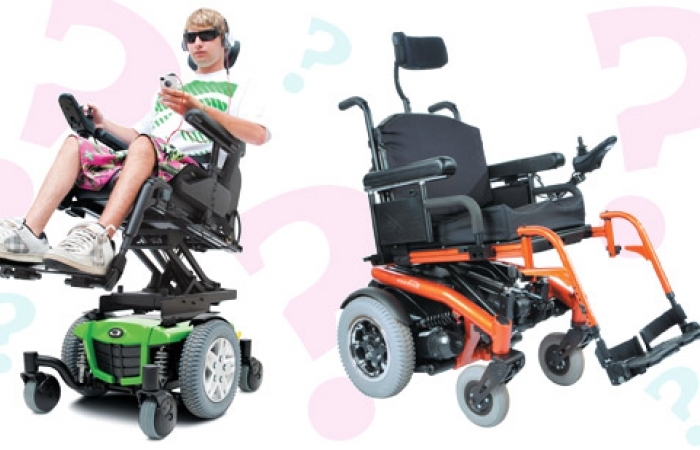 It’s up to users and their team of wheelchair experts to decide which configuration works best for their particular needs. It’s good to have options, but it’s even better when a professional is there to make sense of these options. It’s best to work with a certified rehabilitation technology supplier (CRTS), preferably one who is also an assistive technology professional (ATP). Also work with an occupational or physical therapist (OT or PT) who specializes in wheelchairs. A wheelchair assessment and evaluation is the right time to communicate exactly how and what the chair needs to do in order to support your lifestyle, says Permobil’s product marketing manager Hymie Pogir. What you’ve driven in the past is another important consideration, says Bryan M. Hannley, a CRTS, ATP and PT with United Seating and Mobility in Tucson, Ariz.
“If someone is going into the chair for the first time I would try them in a mid-wheel-drive chair first because they have much better access to different areas,” Hannley says. If chair users already have had experience with a rear-wheel, mid-wheel or front-wheel system, how well did it work for them? “If someone is a successful driver and he can drive with a rear-wheel drive, unless there is a specific reason to change, someone would really have to twist my arm to put them in something else,” says Hannley. But even though familiar may turn out to be better, when being evaluated for a chair, Pogir recommends keeping an open mind about new technology because it’s changing so rapidly. Not only are there differences in the design and performance of the three different drive systems, but there even are differences within the same drive system, depending on the manufacturer. Sometimes the systems even vary from model to model made by the same manufacturer. When choosing a new chair, ask a lot of questions, and don’t give up before getting all the answers. Try out the different drive systems in the home environment, as well as any other environments visited throughout the day. Consider the size and setup of your home, office and wheelchair-accessible vehicle. Do you spend a lot of time outdoors? If so, take it down your favorite trails and see how it does. Each drive system has its strengths and weaknesses. Here’s a look at how each one scores on different measures. The position of the drive wheels significantly affects the space needed for the chair to turn around, and the way the chair maneuvers in tight spaces. There are two measurements that usually are referred to in wheelchair specifications. The 360-degree turning circumference is the entire area needed by the wheelchair to turn in a complete circle. The turning radius is the distance from the center of the chair between the drive wheels (pivot point) to the furthest point on the chair. Mid-wheel drives are the most maneuverable because they have the smallest 360-degree turning circumference and the tightest turning radius (20 to 26 inches), making them excellent indoor chairs. Joshua A. McDermott, of Walden, N.Y., has limb-girdle muscular dystrophy (LGMD) and uses a Q6 Edge from Quantum Rehab, a division of Pride Mobility. An MDA Goodwill Ambassador for Orange County, McDermott, 20, — pictured at the top of this page — works as a consumer advocate with Pride Mobility and Quantum Rehab. Front-wheel drives have a turning radius of 25 to 28 inches and a larger 360-degree circumference than mid-wheel drives. However, they actually navigate around tight corners better than the other two drive systems because the position of the pivot point gives them a very short front end. But turning around in a small space is tricky because of the long back end. Rear-wheel drives have the largest 360-degree circumference and turning radius (30 to 33 inches) of the three drive systems, making them more difficult to maneuver in tight spaces. In addition, the footrests on a rear-wheel drive chair take up more space because they’re typically angled forward at anywhere from 80 to 60 degrees in order to clear the larger front casters. The amount of space taken up by the footrests varies depending on the drive system and the particular angle required by the user. When the footrest angle changes, so does the turning radius measurement. This makes comparing the turning specifications on chairs a little tricky. Most experts include the footrests in the turning radius measurement, but most manufacturers don’t due to the variability of footrest angles. Because mid-wheel drives have small front casters that are wider apart than on other drive systems, 90-degree footrests add less than an inch to the turning radius. On front-wheel drive chairs, there are no front casters to interfere with having 90-degree footrests. When the footrests are counted in the turning radius measurement, they add less than an inch. Mid-wheel and front-wheel drives are less sensitive to problems caused by weight distribution than rear-wheel drives. On all three types of drive systems, pneumatic tires and casters provide the smoothest ride but are rarely used because they tend to get flats. Usually front- and rear-wheel drives provide the smoothest rides when traveling outdoors because they have, or can have, independent suspension, meaning they have shock absorbers on all four wheels. Also, both types of chairs have larger casters (8 to 9 inches), which make for a smoother ride. Most mid-wheel drives have smaller casters (6 to 8 inches), making them the “hardest” ride of the three drive systems. Mid-wheel drives don’t have the type of independent suspension typical of front- and rear-wheel drives. A mid-wheel-drive suspension system tends to deflect and conform as it travels over the surface. Since these chairs have six wheels, there’s an extra set of wheels going over the bumps and sending more shocks into the frame and seat. However, McDermott says his Q6 Edge mid-wheel drive gives a very smooth ride not only on even surfaces but in the woods around his house or at his brother’s outdoor sporting events. “If my front casters are up on another level and the mid wheel [and rear casters] are on a lower level, I’ll still be sitting at a straight level even though my wheels are at different heights,” he says of the Q6 Edge. Front-wheel drives are optimal for traversing obstacles such as curbs, grass, gravel, uneven terrain and snow. This is because the 14-inch drive wheels are the first wheels to encounter obstacles and they pull the rest of the wheelchair over them. With rear-wheel drives, the front casters encounter obstacles first — and obstacles look a lot bigger to those 8- to 9-inch casters. A rear-wheel drive means the drive wheels are pushing the front casters over obstacles. Because pushing is harder than pulling, rear-wheel drives aren’t quite as efficient going over obstacles as front-wheel drives. Depending on the terrain, mid-wheel drives can be one of the easiest chairs in which to become bogged down and stranded, says Pogir. Most mid-wheel drives tend to have these problems because the drive wheels are in the middle of the chair with two 6- to 8-inch casters in front and two in the back. The drive wheels can lose traction in two ways. When the front casters get up onto an obstacle such as a small curb, the momentum can lift the drive wheels off the ground and leave them spinning uselessly. When an obstacle is soft, such as sand or soft ground, the drive wheels (weighed down by the user’s body weight) sink into the soft terrain and the front casters flex up, taking the weight off the drive wheels and cause them to lose traction. This is called high centering — and it never happens with front- or rear-wheel drives. Another important issue with the outdoors is whether or not the drive system can handle steep inclines and declines. Mid-wheel drives are the most stable on slopes because they have both front and rear casters, which keep them from tipping forward or backward. “You’d have to go up or down a cliff to make it go over,” says Pogir. Depending on the location of the batteries, front-wheel drives also can be very stable. If the weight of the drive wheels is in front and the weight of the batteries is in back, the weight of the chair is more spread out. On the other hand, some designs have one battery behind the seat and one battery in front of the seat and the drive wheels in the front. Those chairs have anti-tippers on the front of the chair to make it more stable. Rear-wheel drives are the least stable when it comes to tipping because most of the chair’s mass (batteries, motor) is in the rear, and there’s nothing to counterbalance the weight. That’s why it’s so important for rear-wheel drives to have anti-tippers at the rear. The chair may rock back on the anti-tippers, giving the user the sensation of falling backward, but it won’t tip over. At low speeds (4-5 miles per hour) all three drive systems are equally stable. But when it comes to driving straighter at higher speeds, the rear-wheel drive is the most stable because most of the weight of the chair is around the drive wheels. Because it can cover a lot of ground quickly, this type of drive is helpful for students traveling large high school or university campuses. The mid-wheel drive is less stable at higher speeds. In order for it to turn so quickly, it needs to be more sensitive to the driver. “You have four casters in addition to your drive wheel, so when you turn or go forward or back in a mid-wheel drive you have four casters that all have to spin back into the direction, and that spinning can make you feel as though you are getting off track,” explains Hannley. The front-wheel drive also is harder to handle at higher speeds. Because they’re pulling more behind them, they tend to fishtail when turning at higher speeds. New technology, such as Invacare’s G-Trac or Permobil’s ESP, helps level the playing field by making all three drive systems equally stable and easy to control. These technologies don’t allow obstacles in the chair’s path to throw it off its intended course. Kathy Wechsler is a freelance writer with Friedrich's ataxia based in Tucson, Ariz.
It’s a wonder I was never pulled over for drunk driving in my mid-wheel-drive power chair. In reality, all I’d had was a nice, cool glass of Friedreich’s ataxia (FA), which comes with poor coordination and lack of fine motor skills. I don’t know how many people have this problem, but FA affected my ability to drive my mid-wheel chair. If you don’t believe me, come take a look at the holes in my apartment walls. My mid-wheel drive was reprogrammed more times than I care to count. Bryan M. Hannley, a CRTS, ATP and PT with United Seating and Mobility in Tucson, Ariz., says that because turning happens much quicker in a mid-wheel drive, the user has less time to respond. Hannley, who is also my CRTS, recommended that I switch to a rear-wheel drive and I did. Despite the limited turning radius indoors, I have found that my rear-wheel drive Storm Series Torque from Invacare has worked out much better for my needs overall. I now can drive straighter. It also does exceptionally well on the uneven and rocky jogging trail that is my service dog’s favorite walking area.